I hope you had a wonderful Christmas and fabulous New Year - I started back at work this week which is a bit of a shock to the system after a luxurious eleven days off and lots of peace and quiet !! I managed to do a little bit of sewing but my main focus was organising and documenting my growing pile of quilt tops and WIPs - after only 7 years of quilting I seem to have amassed a huge pile of both - eeek ! I'm putting my list on its own page as I didn't want to clog up this post but the upshot is that I've got quite a list of projects which includes at least 31 quilt tops and about 60 works in progress - there, I've said it out loud !! This is a photo of the bottom of my linen press and the top row is full of tops waiting to be quilted - on the bottom row there are two tops ready for basting and the fabrics on the left hand side are backing and binding fabric for projects not even made yet !! did I mention that my planned quilts list is almost as long as my WIPs list !!!! I'm planning on concentrating on doing one of my WIPs at a time to try and get the list at least half done by the end of the year and rather than picking projects for a finish along I'm just going to go at my own pace and not stress :) I'm actually giggling that I just wrote that as I'm currently working on five different projects !! I'll see how I go - the main thing is to get some of those quilts finished so I can wrap myself up when winter arrives, which isn't that far away for us Aussies !! Even though I'm trying to get my already started pile down I am adding some new projects too ! Amy at Stitchery Dickory Dock is doing another Sugar Camp BOM which I'm going to join and you can too - all the information on the free BOM is here ! 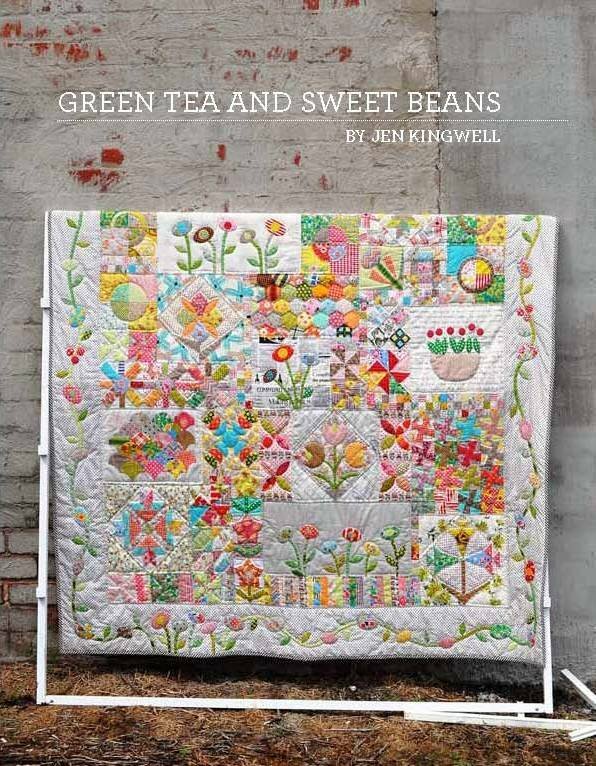 I'm also doing Jen Kingwell's Green Tea and Sweet Beans as a long distance sew along with my Mum. The other new project I want to do soon is to make a cover for my beautiful Bernina that I've now had for 2 years - its overdue !! oh and I'm also going to try and blog on a regular basis - I've been sucked into the Instagram vortex for a while but I really miss having more detail and photos that only happens with blogging. and just to add one more to my WIP list, at the beginning of December I decided to make a nine patch quilt by making one block a day and using only scrap fabric - Amanda Jean of Crazy Mom Quilts has all the details of this sew along that she did a few years ago on her blog - and I've been keeping up mostly - over christmas I was sorting the scraps and cutting out the blocks and then I'd chain sew a few blocks at a time. I'm more than half way through so I will have another top to add to the list in no time ! linking up to the first 2016 Work in Progress Wednesday over at Freshly Pieced ! Wow!! That's quite a WIP pile you have there. I don't feel so guilty about mine now. I like your approach to getting them done - I don't think I'll link to Finish alongside either. I'll just go at my own pace too. I hope we have less WIPs by then of 2016. (Well old ones anyway). Wow, you have enough to keep you going with WIP Wednesday for awhile Leanne! I like your idea for the nine patches. Blimey, that's quite a pile of WIPs - I can't wait to see them appear and develop over the year! work in progress on a Friday !